Like most paths in Prairie Creek Redwoods State Park, the Brown Creek/South Fork loop starts along the Newton B Drury Scenic Parkway, the nine mile road through some of California's densest redwood groves, and it encounters relatively varied scenery, from very dense, lush and overgrown forest around the lower end of the creek to drier, lighter, more open hillsides higher up. 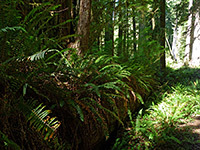 The Brown Creek Trail follows a small stream up a sheltered valley, shielded from traffic noise, then meets the Rhododendron Trail which climbs another 350 feet up a ridge, returning to the highway via a steep descent along the South Fork Trail. Despite the easy access, again like the majority of trails hereabouts, people tend to walk just a short distance, since the forest can appear unchanging, yet there are many differences such as tree size, forest density, bark coloration and types of understory vegetation, and this 3.4 hike is the shortest loop in the park, so a good choice if time is limited. The elevation gain makes the trip just a little strenuous. 10 views along the Brown Creek and South Fork Trails. The hike starts 2 miles north of the edge of Elk Prairie, at a well-marked trailhead with plenty of parking space. A short path heads west, connecting with the Prairie Creek Trail, but the principal route is on the east side of the road, and like all paths in the area, each junction is clearly signposted. This initial path is the South Fork Trail, which very soon reaches the first intersection - the Foothill Trail forks off to the right, paralleling the road and reaching the Big Tree after 1.4 miles, while the main route continues further into the forest, close to a small trickling stream (Brown Creek). A huge fallen redwood trunk forms a natural bridge, one of several along the loop, all covered by moss, ferns and new trees, often quite substantial. The next junction is at the start of the 1.2 mile Brown Creek Trail (on the left), part of a loop that, together with a section of the Rhododendron Trail, gains height more gradually than the remaining 0.7 miles of the South Fork Trail so the clockwise direction is preferred. Past the junction, both paths are rather narrower than before, suggesting that this is the point where most people turn back. 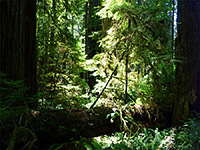 The Brown Creek Trail sets off close to the stream, through nice, lush groves of huge redwoods growing close together. 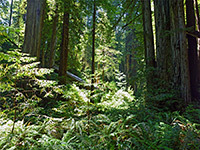 It crosses to the north side of the creek and after a while passes through a more open region, where the forest floor is covered by a thick carpet of ferns. Another junction is with a spur to the Carl Shenck Memorial Grove, one of several commemorative sites en route. The ground starts to rise more noticeably, as the path bridges the creek again just before the next intersection, with the Rhododendron Trail; this heads north towards the CREA Trail (1.6 miles), and south to the South Fork Trail (1.2 miles) and Cal Barrel Road (2.4 miles). Turning south, the route climbs steadily up the side of a ridge, away from the well-watered valley floor, then traverses a steeply-sloping hillside, curving around a number of tributary ravines, before another sharp ascent to the final junction, at the upper end of the South Fork Trail. 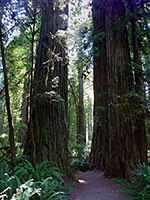 The redwoods in this part of the forest are smaller and more separated, allowing for longer views back down towards Brown Creek. The South Fork Trail, signed 1 mile to the highway, has a consistently steep downwards gradient, through woodland that becomes steadily denser and more enclosed, until the path arrives back at the start of the Brown Creek Trail.